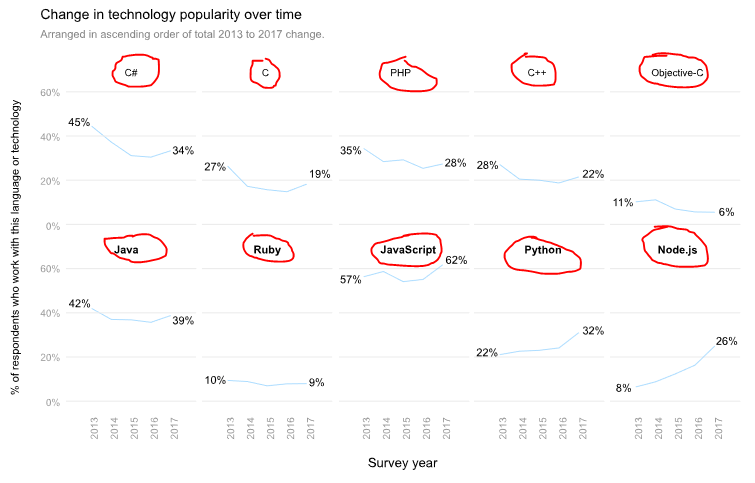 In the Stack Overflow Developer Survey Results 2017, the Languages Over Time graph (direct link to the .SVG used on the page) shows the popularity of ten languages over time as ten separate graphs. Either the names of all ten languages should be emboldened, or none of them should. Browse other questions tagged discussion survey-2017 . No salaries over 200k for 2017 Developer Survey? Why do Vi and Emacs have Stack Exchange sites but other tools don't?